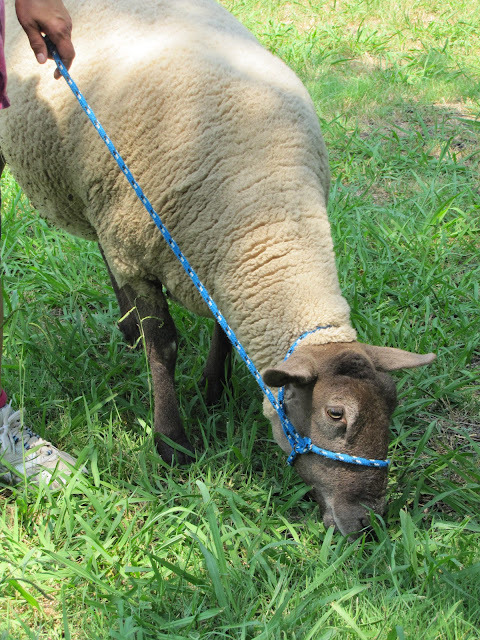 Farmhand Gail decided two things this morning... first of all, the front yard was getting kind of shaggy, and B) the sheep needed to brush up their halter training. She started with the easiest student in the paddock - Shadrach. Shad already thinks he's a Labrador Retriever, so adding "heel" to his repertoire of commands wasn't much of a stretch. Especially when he was surrounded by tall green lawn and a few sheep treats for motivation. Very biddable, for a sheep. He's a sweet ol' sausage. Good boy. Now trim the lawn. Hard to believe they were so recently shorn--just look at that handful of yummy fleece on him. He is a sweetheart!! I'm so jealous of your well behaved sheep! Ours think we are putting on noose on instead of a harness! Especially if there is lush grass we are walking past. What's your secret?!?! Still laughing. And, Marissa . . . Bwwwahahahaha! Shad wasn't a bottle baby, but he was handled a lot as a lamb, and is very friendly. And he'll go just about anywhere if you shake the grain bucket. when I saw the word "Heel" I thought it was going to be a puppy post!! !